M.I.A. is a British rapper who rose to fame in the late 2000’s with the release of her second studio album Kala and its triple-platinum selling single “Paper Planes”. The song was everywhere when it was released in 2007, and is widely regarded as one of the best pop songs ever. This tale of a hustling immigrant has been sampled by artists such as Jay-Z and T.I., and is definitely one of the most recognizable songs of the past decade. The song is one of the most memorable songs from the 2000’s, and that can be attributed to its sound and hook. The sound is unlike anything else that was, or is, on the radio at the time. It’s airy yet impactful, and is instantly recognizable from its sample of the Clash song “Straight To Hell”. The hook is supplemented with gunshot and cash register sound effects and features the hustler credo that all she wants to do is take your money. The sound effects not only work with the mantra of the song, they make the listener more inclined to sing along. It’s nearly impossible to listen to the song and not do the hand motions, like you’re firing finger guns and taking money just like M.I.A. herself does in the video. It just all works so perfectly together, and is a superb piece of songwriting. She switches to a dark blue pair during the video. The music video is set in New York City, and shows M.I.A. walking around town, dancing with friends up and down the streets of the city. She also spends time selling sandwiches to New Yorkers while on a food truck. All throughout the video, there are CGI paper planes flying overhead to tie all the scenes together. M.I.A. 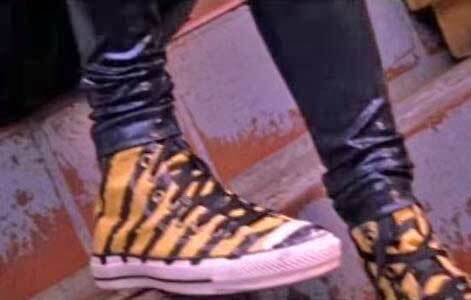 wears a pair of custom tiger chucks in the beginning of the video, then switches to a dark blue pair midway through. The video fits the vibe of the music and really hammers home the hustler mentality of the song. The shoe of the hustler trying to make it in NYC. Get a new pair of chucks to wander around New York in by clicking on the links below.